Do you ever feel at war with yourself? 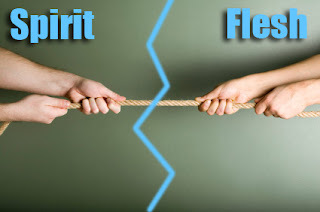 I suppose this can happen in many different ways with different people but for me lately, it has been a constant war with my spirit and my flesh and the desires of both. Our pastor has been doing a mini-series on Elijah (which has been amazing) and he's talked the last couple weeks about going into the "deep" spiritually. Coincidentally enough, "launch into the deep" has been the call I've heard from God for a couple of years now without really knowing what He meant by it. There have been a few times where I thought I knew, only to find out later, that's not quite the direction He had in mind. But this idea of the "deep" has not been new to me and God sends it roaring into my radar every now and then just to make sure I haven't forgotten that He's called me to the "deep." What that "deep" is I'm still praying through. Letting go of the reigns of my life so that He can truly REIGN in my life. Letting go of what I think I know so that He can be the ONE that I KNOW. Letting go of what I think I want so that He can do what HE WANTS. Letting go of my desires so that He can give me HIS DESIRES. So I find myself vacillating between these two extremes and it frustrates me. I don't want to cater to my flesh. I want to feed my spirit and allow God to do what He will. I'm sure I'm not alone in finding myself comparing my Christian walk and life to others. I see how God uses others in such incredible ways and wonder why not me, Lord? But then our pastor said something that punched me in the gut on Sunday morning and has been bubbling at the surface of my mind the last few days. He said, "What is significant about those that God uses is not their gifts, talents, or position - it is their SURRENDER." That's just it - I have not fully surrendered. And I know that surrender is not a one time deal. It's a process. A process that God and I are working through together. I know that the flesh is where the enemy wants me to stay and camp. But I also know that I have a Savior fighting for me. My prayer and my plea is that I will seek the Lord with all that I have and allow Him to continue to refine me. I know that refining may hurt and it might not be pretty. But I also know that it is out of the ashes of a life broken for Him that He can truly make beauty. I've seen it first hand. I want to experience all that obedience and surrender to Him have to offer. Therefore, no matter what, my spirit will win the war over my flesh. There is no other option. Wow. It has been months since I've blogged. Never my intention. But school started and life just went full blown crazy after that. Lots of changes happened this year at school and I was involved for a while in what seemed like a million different things. Then, I let a few things go and have been trying to be more intentional about spending time with my family. But I miss writing. Every so often I think about a topic I'd like to write about and then....life just happens and I forget. Well, here I am now. Last July I wrote a blog titled "Full Circle" about my reunion of sorts with my roommate from college. Little did I know in July, that I would become part of a team of incredible women who would plan a 5k to fight human trafficking in our city and abroad. 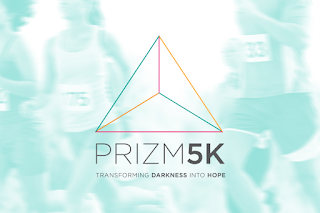 My amazing church is hosting our 1st annual Prizm 5k on April 23rd to raise funds for Porch Light ministries that operates a local safe house for rescued girls and also for The Hard Places in Cambodia that has been and is doing incredible work to fight trafficking over there. We've been planning since October and as soon as we knew the date and the final details, I asked my girl if there was any way she could hop on a plane to come speak at our event. She said yes. She bought the ticket. And in 19 days, I get to see her radiant face and hug her and rejoice over the story that our incredible God wrote for her and decided (for whatever humbling reason) to make me a part of as well. We are both giddy with excitement and overcome with complete joy that God has written this into both of our stories...that after 10 years, we get to be together again. She made the statement last week that this was so surreal for her. The last time she was in Lakeland (or Florida for that matter), she was selling herself/being sold...and now, she is coming back to help free other girls like her. If you don't believe that only God can orchestrate something so meaningful, then I honestly feel sorry for you. THAT, my friend, is a full circle. A complete circle sealed together with love, friendship, restoration, forgiveness, safety, family, and peace. This time when she runs...she gets to run FOR freedom instead of TO freedom. This time when she runs....she gets to run TO HELP RESCUE instead of TO BE RESCUED. This time when she runs...she gets to run TO HELP GIVE LIFE instead of TO SAVE HER LIFE. This time she gets to run for others instead of herself. What about you? What have you been running from? Could you put that energy toward something greater than yourself? If you're anywhere in the Greater Orlando or Tampa area or anywhere in between, register for our Prizm 5k. You won't be sorry. Maybe you can be a part of a full circle story for someone else.